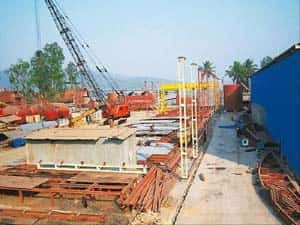 Bidding war: A Bharati Shipyard facility in Thane. The firm has bought 1.11 million shares of Great Offshore for Rs62.4 crore. Mumbai: Private shipbuilder Bharati Shipyard Ltd upped the ante in the battle for Great Offshore Ltd, India’s largest integrated offshore services provider, by picking up an additional 3.01% stake, raising its holding to 22.48% and effectively boosting the open-offer price. The shipbuilder has spent around Rs305 crore on acquiring its 22.48% stake in Great Offshore. The shipbuilder bought 1.11 million shares at an average Rs558.81 apiece through Dhanshree Properties Pvt. Ltd, a Bharati Shipyard unit, for a total of Rs62.4 crore. ABG Shipyard Ltd (ABG), India’s largest private sector shipbuilder, had proposed an open offer of Rs520 per share on 5 August for Great Offshore to lift its 7.87% stake. The highest price paid on Wednesday was Rs560, which becomes the new level at which shares should be bought in the open offer. ABG said it hasn’t decided on its course of action yet. “We will take a call at an appropriate time. Nothing has been decided as of now," Dhananjay Datar, chief financial officer of ABG Shipyard, said when asked whether his company will revise the current open offer price. He added that ABG is waiting for approval from market regulator Securities and Exchange Board of India to start open-offer proceedings. The two companies have been locked in a bidding war since 7 May when Bharati Shipyard acquired a 14.89% stake at Rs315 a share through stock pledged with it by Great Offshore’s promoter Vijay Sheth. On 4 June, Bharati made an open offer to buy at least a further 20% stake in Great Offshore at Rs344 a share. This was followed by counter offers and multiple upward revisions of the offer price by both the firms. Great Offshore shares rose 4.93% on the Bombay Stock Exchange on Wednesday to close at Rs565, while Bharati Shipyard’s shares were marginally up by 0.94% at Rs208.65. The shares of ABG Shipyard rose by 1.03% to close at Rs265.15.